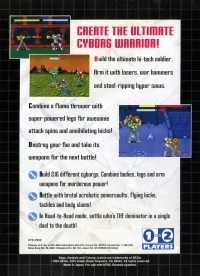 Box Text: CREATE THE ULTIMATE CYBORG WARRIOR! Build the ultimate hi-tech solider. Arm it with laser, war hammers and steel ripping hyper saws. Combine a flame thrower with super-powered legs for awesome attack spins and annihilating lucks! Destroy your foe and take its weapon for the next battle! *Build 216 different cyborgs. Combine bodies, legs and arm weapons for murderous power! *Battle with brutal acrobatic somersaults, flying kicks, tackles and body slams! *In Head-to-Head mode, settle who's THE dominator in a single duel to the death! 04-10-2017 shepard11 Box Text CREATE THE ULTIMATE CYBORG WARRIOR! Build the ultimate hi-tech solider. Arm it with laser, war hammers and steel ripping hyper saws. Combine a flame thrower with super-powered legs for awesome attack spins and annihilating lucks! Destroy your foe and take its weapon for the next battle! *Build 216 different cyborgs. Combine bodies, legs and arm weapons for murderous power! *Battle with brutal acrobatic somersaults, flying kicks, tackles and body slams! *In Head-to-Head mode, settle who's THE dominator in a single duel to the death! 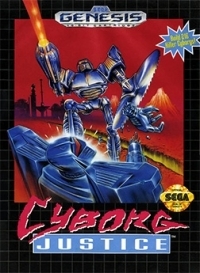 This is a list of VGCollect users who have Cyborg Justice in their Collection. This is a list of VGCollect users who have Cyborg Justice in their Sell List. This is a list of VGCollect users who have Cyborg Justice in their Wish List.